We have a Virginia Creeper that grows along our fence. Every fall, it's leaves turn a beautiful red. I remembered to go out this year and take a picture... and found a surprise. I didn't know that it produced berries. 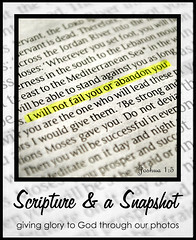 I decided to use this picture for Scripture and a Snapshot, because it brought a great verse to mind. The verses we chose go together! Such beautiful colors and beautiful berries and I love the perspective. Beautiful verse. I didn't know that they had berries either - that verse is great to accompany your scripture verse today. Beautiful photo and love the verse. Thanks for sharing. Joining you at Katie's. Beautiful! I also didn't know about the berries. I love learning something new. Have a wonderful Scripture Sunday. Very lovely! That's one of my favorite verses. What a wonderful surprise to walk out and find!!! Excellent verse for this picture. beautiful colors! love the verse you chose to go along with this shot. what a beautiful Virginia Creeper especially with the berries! The verse goes well...God Bless!